February 2011 was AMMF’s first Cholangiocarcinoma Awareness Month and what a busy month it turned out to be! But what did it achieve? Our Facebook page has many more friends, we have received a considerable number of donations, many people have committed to raising sponsorship by running, slimming, climbing, cycling, bed pushing (yes, bed pushing!) and, most importantly, through all this activity the awareness of cholangiocarcinoma has been and will continue to be raised. And, of course, until the next Cholangiocarcinoma Awareness Month comes round, AMMF will continue working to raise awareness, provide information and support research into cc until the answers are found. 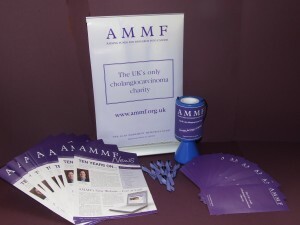 For anyone wanting to help AMMF, collection boxes, leaflets, newsletters and ribbon pins are all available – please contact us if you would like any of these.